It would appear that summer has inspired many things: The Boys of Summer and The Summer of Love to name two. This year is becoming The Summer of Discovery on the mountain. Since late April three new species that were not listed in the 1990 flora have been added to the roster of plants. Within 4 weeks two new species in the Plantago Family were discovered. 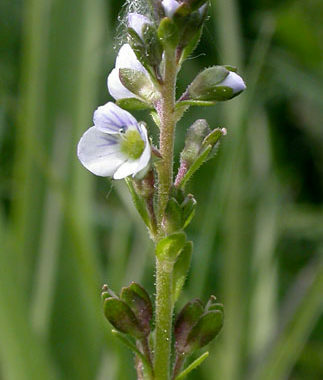 The first is native: thyme-leaf speedwell (Veronica serpyllifolia ssp. serpyllifolia), which is spreading and decumbent, 3-6 cm tall, with tiny white 4-petaled flowers, 3-5 mm, with purplish veins. It looks great when viewed through a 10X loupe; otherwise, it is easily overlooked. The plants are located near a picnic table adjacent to the main parking lot in a shaded moist area. The other is non-native: water speedwell (Veronica anagallis-aquatica) which as the name suggests is a true water-mud lover. It’s much larger with opposite lanceolate leaves, 5-8 cm long, somewhat decumbent with stems up to half a meter long and 4-petaled pink flowers about 1 cm in diameter. It’s set for business under the eucalyptus along Old Guadalupe Trail where fog rain keeps the ground wet year-round. Then June and July brought surprise discoveries in the Orchid Family. I have been looking for a particular orchid for at least fifteen years, one that is rarely seen. David Nelson and I were poking around the Brisbane Acres off Margaret Avenue in June when we spotted my holy grail in the oak-leaf duffÂ—spotted coralroot (Corallorhiza maculata). It was once thought to be a saprophyteÂ—a plant living off dead matterÂ—but it is actually a myco-heterotroph, which means that it does not produce its own energy but obtains it from fungi. It lacks chlorophyll, leaves and photosynthetic green tissue, and gets its food by parasitizing the mycelium of fungi which are, in turn, parasitizing the roots of living plants, in this case oak tree roots. This is quite common in orchids. The stem is 2-7 dm tall, red to brown in color (albino forms are creamy-yellow) and may appear solitary or in clusters. Despite its name, it has no roots but a tangle of coral-like rhizomes. Some natives used the dried stems brewed into a tea to treat colds, pneumonia, and skin irritation. Sometimes when you are looking for a particular orchid you discover a different one. ThatÂ’s what happened when a good friend, Mark Sustarich, was looking for Spiranthes, ladies’ tresses, and discovered a whole bunch of broad-leaved helleborine (Epipactis helleborine) next to a seep on the Summit Trail. Like most orchids, it also relies on a micorrhizal symbiosis for food but it has green leaves so it photosynthesizes. It also has an intoxicating effect on bees and wasps. If fungus carried on their heads enters the nectar tip, fermentation begins, creating alcohol and other intoxicating (opiate?) substances. We were actually petting the backs of yellowjackets who were too looped to care! The intoxicated bees cannot get the pollen off their head and the addictive plant guarantees efficient pollination. What sinister seduction!! While walking on the Saddle Trail one sunny morning I discovered hillside morning glory, Calystegia subacaulis, growing at the trail’s edge. Previously we discovered some on Juncus Ridge off Hillside Boulevard so this was a new location, as was the discovery of a new population of Franciscan paintbrush on a ridge top above the Cow Palace. This was encouraging because this is the rarest of the three paintbrush species here and it has been blinking out in spots in this area. And of all the weird things I see walking in the park the sight of a coast red elderberry growing quite nicely out of a bough in a eucalyptus tree certainly takes the cake. I expect to see leather fern, an epiphyte, in those places but not elderberry. When comparing size and bravado, nothing beats the dichotomy of the Allen’s Hummingbird. At 3.75 inches long and 3 grams in weight, this little warrior fears nothing. Allen’s are so aggressive that our resident Anna’s Hummingbird nests before their arrival. Ravens and Starlings are also aggressive birds in their own right, with Starlings uprooting Northern Flickers out of a nesting cavity if need be. So imagine my light-hearted laugh when I spied Allen’s chasing a raven and a starling! Like clockwork, Father’s Day brings Rose-breasted Grosbeaks to the Bay Area. There was one particular grosbeak that was singing in the oaks in the Day Camp but refused to come out in the open. This is very frustrating to birders because the bird can see you and if he’s shy he’ll refuse to move even though he seems to be a few feet away. Well Mr. Shy Grosbeak finally flew out into the open, exposing the bright red triangle on his white chest, and low and behold he was being chased by an Allen’s Hummingbird! Good things really do come in small packages. I can’t forget the coyote I saw right where the Day Camp Road, Old Guadalupe and Bog Trails all meet. I was in the picnic area and had opened the metal cover on the trash receptacle to make a deposit when he appeared and stopped to look at me. A park ranger was at the entry kiosk and didn’t look up to see him as he squeezed under the gate to the parking lot. He stopped to look at me again but as I dropped the cover to close it the metallic bang scared him and he dashed across the parking lot and disappeared. I felt sorry that the ranger missed this beautiful creature. The summer wildflowers are in bloom now. Beside the helleborine there is a more common orchid, rein orchid as well as coast gumplant, goldenrod, tarweed, skunkweed, mugwort, twinberry, dudleya, and the snowberry is showing pink flowers and the eponymous snow-white berries at the same time. You can also see the stunning dichotomy of fiery-red poison oak leaves against the green leaves of coyote brush.